Back pain is a problem for many people, and whether it is a chronic condition or an intense flare-up of an occasional problem, finding a remedy that relieves it and prevents it can sometimes be a challenge. Instead of treating yourself with pain medications that will only wear off, requiring you to medicate again, take advantage of some exercises that might help you with your back pain. In addition to making you feel better, physical activity and basic exercises can even prevent pain from returning. If the pain is intense or does not go away, make sure you consult your doctor or a chiropractor. While the common suggestion is often to “rest” when you are experiencing back pain, a little activity might actually do more for your back than bed rest. If you find a comfortable position while resting, go ahead and stay there for a while. However, get yourself up and moving as soon as possible. You want to train your back to function properly again, and the best way to do that is to move. Do something simple, like walking. You want to avoid any strenuous activities or exercises that might have triggered the pain in the first place. Think about your posture too. Walk with your back straight, your shoulders back and your head up. This will keep your back aligned and not hunched. The nerves around your spinal column can easily get pinched or compressed if you do not have good posture, creating additional pain on top of what you are already experiencing. Do strengthening exercises that will build muscles in your back, hips, stomach and shoulders. Stretching out these muscle groups may relieve your back pain. As you continue to exercise these areas and workout any strains or areas of tension, you will be less likely to feel pain in those areas in the future. When they are more flexible and stronger, you’ll feel better. Regular exercise in these areas will also help muscles to repair themselves more quickly. If you do injure yourself, your body will be able to recover faster and more thoroughly if you are doing regular exercises to prevent and treat back pain. Cardiovascular exercise is also helpful in preventing back pain. Working out your heart muscle will keep you more energetic, providing endurance and promoting a strong, healthy body. Again, you’ll be able to speed up your recovery time if you are doing some sort of aerobic or cardiovascular activity on a regular basis. As you exercise to treat and reduce back pain, focus on your legs, back, shoulders and stomach. Building a strong core will protect your back against injuries and help it to recover faster. As long as you are not doing anything too strenuous, getting regular physical activity will help your back pain a lot more than lying in bed and popping pain pills. You might also have problems with your alignment, so seek treatment from a chiropractor if you are not able to get rid of your back pain in a reasonable amount of time. 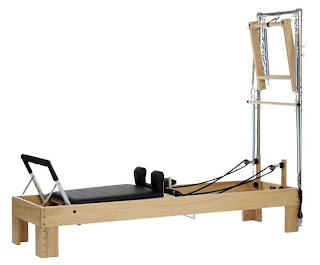 This post was written for Pilates for the People by Dr. David Kulla. Dr. Kulla is a licensed NYC Chiropractor and a nutritionist as well as owner of Synergy Wellness in Manhattan. The fact that the Pilates industry nowadays is dominated by females, breeds the misconception that Pilates is a female-only activity. That it is only for dancers. That you have to be flexible and crazy coordinated to do Pilates. I have seen and heard men patronize other men who practice Pilates, and many men are concerned whether they will be the only one of their kind in studios charged with females, practicing this so-called women’s exercise. What most people don't know, is that Pilates was created by a cigar smoking, whiskey drinking boxer, acrobat, and gymnast named Joseph Pilates, who created his exercise program from this background first and foremost for men. I have archival footage of Pilates teaching high energy mat classes to large groups of men outdoors in a field. He started developing his method at an internment camp in England during World War I, attaching springs to the beds of the bedridden to rehabilitate them, and gave the physically sound his floor exercises. Pilates also was a physical education instructor with the military police in Germany prior to migrating to America and settling in our very own New York City. Pilates originally trained athletes--boxers (he trained boxer Max Schmeling), wrestlers, skiers, gymnasts, and circus performers. It wasn’t until when choreographer George Balanchine and dancer Martha Graham caught onto his method, influencing the influx of dancers to seek out his studio, and embrace the Pilates practice, which perhaps is when the gender shift in the method started to occur, hence the misconceptions that Pilates is only for women or dancers. I have attended workshops wherein Jay Grimes, who studied under Pilates himself, mentioned that Pilates did not like training dancers and he would send them to his wife, Clara. More men are now starting to rediscover the Pilates method and its benefits for their distinct own goals. We have seen men come into the studio seeking to improve their balance, flexibility, coordination and posture, increase their core strength, address low back pain and muscular imbalances, as well as to cross train. Many male athletes have turned to Pilates to find their edge and strengthen their game. A few athletes who have made Pilates integral to their physical conditioning are golf stars Tiger Woods, Rocco Mediate, and Phil Michelson, NBA’s Greg Oden and Jason Kidd, NFL’s Ruben Brown, and MBL pitcher Curt Schilling. 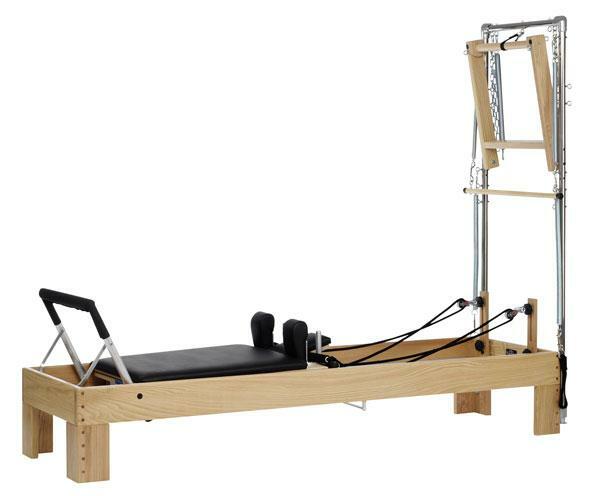 Some NBA and NFL teams have invested in Pilates equipment to incorporate the method in training their athletes. Pilates complements every movement and activity one does, whether it be sitting behind a desk, climbing stairs, picking up a bag of groceries, running in the park, swinging a golf club or bat, or dribbling a ball across the court. It will heighten coordination, and improve balance, flexibility, and posture. It is an intelligent workout that will sharpen focus and increase the ability to concentrate. Those looking for an auto-pilot type of workout must look elsewhere. It will re-educate the body on how to move with more efficient movement patterns, initiating from the powerhouse (center of the body), and develop core strength in the deep muscles of the back to stabilize and protect the back. The truth is, Pilates is for everyone: men, women, teens and children, the athlete, the sedentary and de-conditioned, the injured, the flexible and inflexible, the coordinated and the uncoordinated, the survivor, and the elder. Pilates is ageless, colorless, and genderless. Pilates is not black or white, but shades of grey. 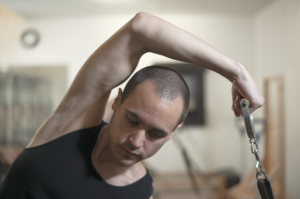 To the Pilates-practicing man, may you continue to reap the powerful benefits the method has to offer. For the curious men out there who are intrigued by Pilates, but have been hesitant to try it for one reason or another, I urge you...perhaps even challenge you, to try the method and explore what its benefits can do for your mind, body, and entire being. The true reality of the method lies not in what one thinks they see on the outside, or in the noise they hear about what people say it is for, or whom it is for. Its true reality lies inside ourselves, where if the Pilates method is invited, it will revolutionize our mind, body and lives.